Last January we woke up one morning and the drain was backing up in the yard. We could see it wasn't really draining right. There was a lot of snow out there that was melting so the backyard was beginning to flood. We had a Roto-Rooter-like company out. When the guy ran a snake, he bumped into something. He couldn't figure out why he could not snake out that drain and basically just left, saying, "Oh, well, I can't help you." He walked out and charged me for the visit, but didn't resolve anything. So we called a contractor referral service and got 2 names of plumbing contractors. I called the first one at 9:00 at night or something like that and explained the situation to him. And the contractor was very, very calm and reassuring throughout . The next morning, he came out with a camera and a scope. When he ran the camera down the drain, he realized that concrete had collapsed into the drain somewhere in my yard and that it was going to be a major project. I stayed at home and sent my wife and daughter to stay with my parents a couple of miles away for a few days. If I remember correctly, the contractor's crew actually did a temporary sewage pipe where they just rerouted it, not totally finished or tied in, but just so that I had plumbing the first night. They ended up having to excavate the entire backyard. And we had the wonderful adventure of finding out that our sewer had never been rerouted off the front yard. Our sewer was going in the wrong direction. They had to pull up basically all the backyard concrete. 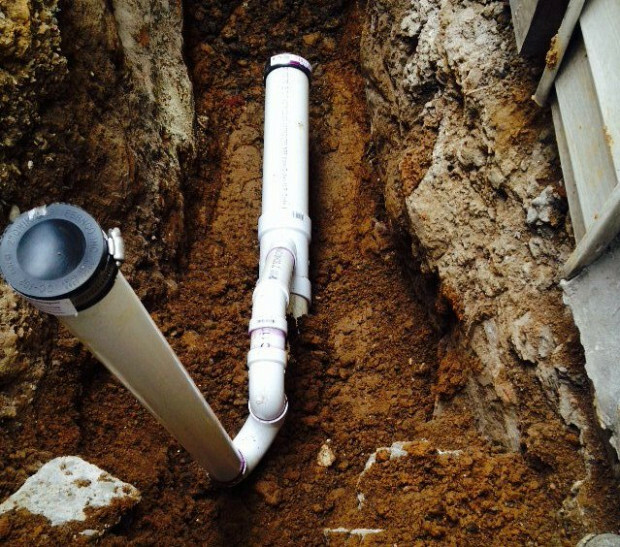 We live in a major city so we have 120-year-old terracotta sewage pipes. And almost every time we touched the pipe, a new section just crumbled to dust. They ended up getting down to a really wide junction and tied brand new PVC into that and then all the way back into the house. They rerouted both of the drains in our backyard so that they were more centered. They also tied a couple of drainpipes back into the house to give us better drainage from the bathrooms and the kitchen. 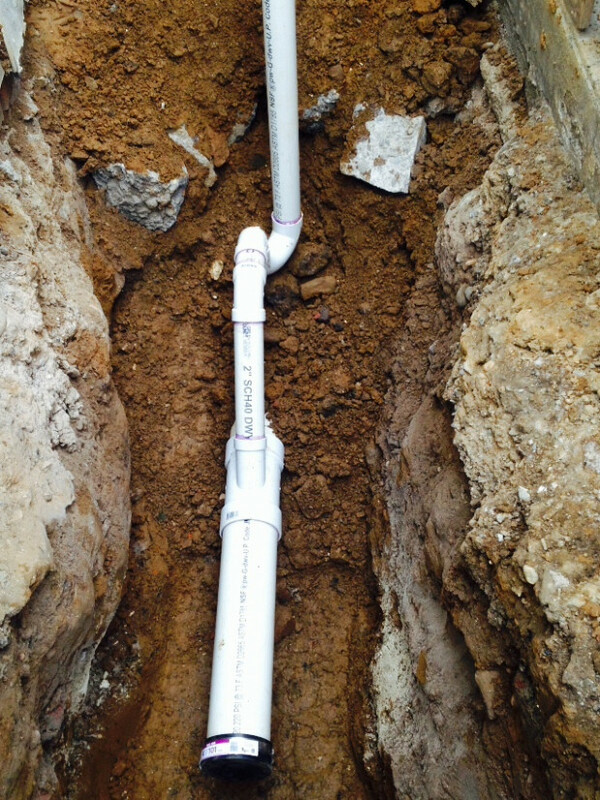 Then they had to bury the plumbing back up and cement it. 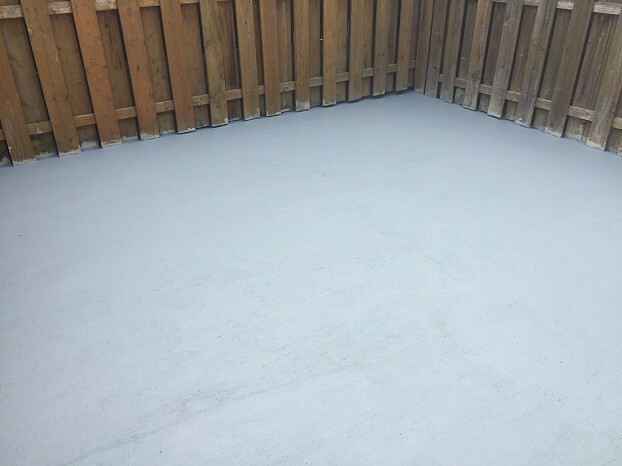 Finally they put a smooth top layer that they finished with a swirl patterns with no joints and all the same color so it looks very pretty in the backyard. The majority of the project like getting the silicone pipe together and getting the plumbing back up was 3 days, I think. And there was a lag time of about a week to pour the first layer of concrete plus another week to rip it out and repour it when it got wet. 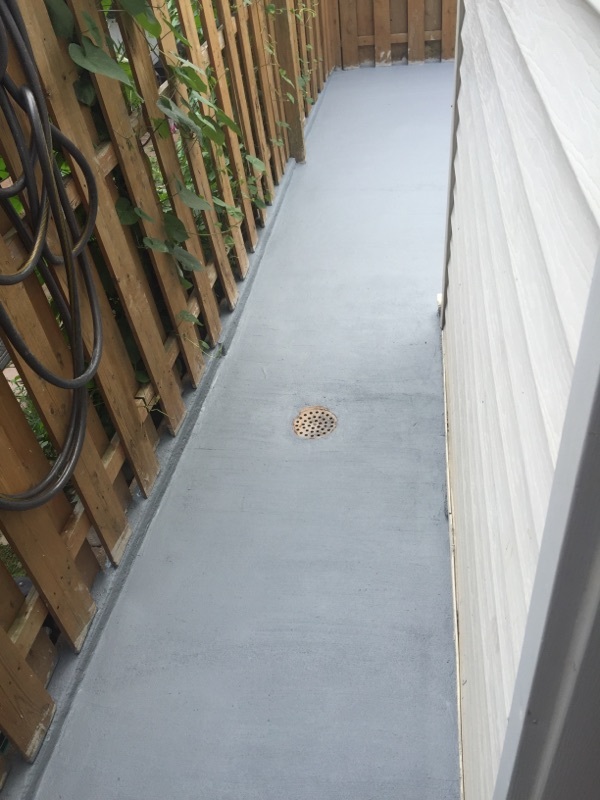 With the repour of the concrete, the project took 2-3 weeks. Fortunately, the guys were very friendly, knowledgeable, and respectful of our house, our family, and our property. They were very careful not to mess the floors up and get dirt on the floors or curse in front of my daughter. We have a 4-year-old that they were always very respectful of with the noise and the language and stuff like that, so we couldn't have been happier. I think our contractor's outstanding quality was the fact that he was always calm and collected and was able to put us at ease with how stressed out we were. And one of the other good qualities -- he was really good at attention to detail and willing to make sure things were done correctly. An example of that is when they poured the initial concrete on a day when the weather report said "Rain 3 days away," but it started raining an hour after they poured. So the contractor had his guy come out there and rip out all of the concrete. They poured again a week later when it was dry, without me even asking. I was looking for a way to ease the pain and he said, "No, the concrete's compromised. We're going to rip it out and redo it." I thought that was very nice and very professional of him. We've had them back to do a number of other smaller projects. I actually referred them to my own mother and father. We couldn't have been happier with the work they did. And it really does look fabulous out there. Replacement Water Heater for Our Condo at the Lake by Rich P.
Whole House Fan Installation Saves Me Money on Electricity by Mike W.